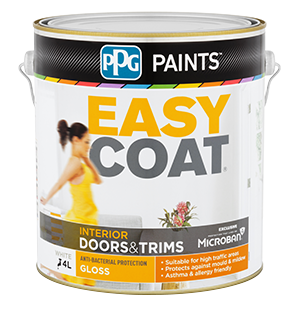 Protect your doors and trims from mould and mildew with the durable PPG Paints EasyCoat Doors & Trims. The only paint featuring Microban technology, it keeps your home safe from fungal growths and triggers of asthma or allergies. Ensure surfaces to be painted are clean, dry and free of contamination. Walls should be wiped down with a mild detergent and rinsed clean with fresh water, even if they don't appear to be dirty, to ensure removal of any surface contamination and ensure the paint has a clean surface to adhere to. 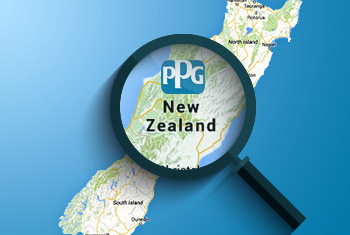 Seal new or bare plaster, wallboards or Gyprock with PPG Paints 3 in 1. Remove all loose or flaking paint, wash all areas thoroughly to remove any surface contamination. Treat surfaces affected by mould with chlorine bleach diluted one part bleach to four parts water. Rinse clean with fresh water. Spot repair any bare areas such as filled holes as per directions for new work. Water wash up, away from drains. Up to 16m²/litre, depending on nature of surface. Coverage will be lower on rough or absorbent surfaces.